Sorry for the late response to the question about sarah burton’s website- it is verdigrisknits.com. She was so great and you need to check out her website! There are only 11 seats left on the bus to stitches, so if you are considering going to Sitches with us on aug. 27, you need to send in your check for $50. or come by the shop. We can not hold spaces or take charge cards. If the bus fills up, we will hold checks for a second bus. Dates for Susannie’s crochet clutch bag (Photo in previous blog and I will send new photos of a two she just finished)are Mon. June 5 and 12 from 10-12 or 6-8 pm. cost is $25 plus materials. You will have enough yarn for a small coin purse as well. Call or come in to reserve your space. Hook size will depend on the yarn you choose, so bring a variety of hook sizes with you if you have them, or we can sell you the right size for your yarn. 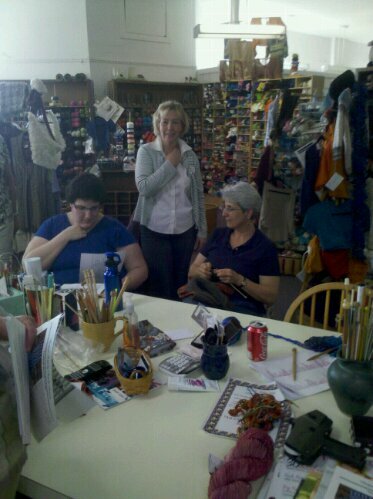 Next tues, May 24 (and all tues nights until July 31), will be Classic Elite Yarn Knit-A-Long knit night from 5-7 pm. I just got in 3 of the spring books from Classic Elite that I did not have before so there are some more options for projects. You can do as many projects as you want, and you will be entered in the drawing depending on how many balls of yarn you purchase. Connie is already on her second bag knit out of Sprout. I think she is going to make them for Christmas gifts! Remember, one person from each store wins a $100.oo gift basket from Classic Elite Yarns! 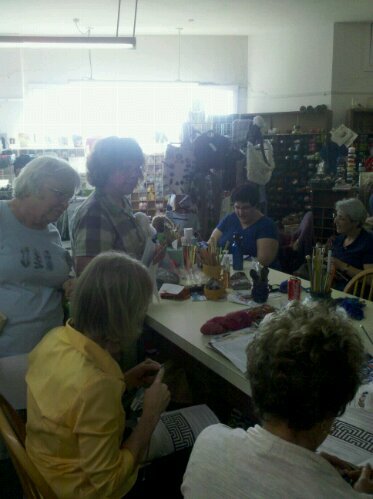 We are still collecting the pennants for the knitting bomb day. Bring them into the shop when you visit , but definitely by June 6th. What the heck is that you say? It is the answer to your woes about leftover yarn, projects you will never finish and needles you wont ever use again. You can sell your stuff at our Fiber Festival! All you need to do is go through your stash, bag it up in Ziploc bags with your name and how much you want for it on an index card. Drop your bags off between june 13 and july 1. The sale will be held on Sat. JULY 9 from 10-1 in the parking lot at the shop (weather permitting, inside if it rains ). 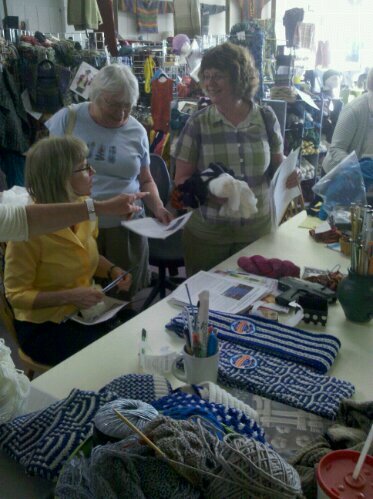 What you sell will become a store credit at Mass Ave Knit Shop. Cost to you to participate is $5.00. This is a one time fee no matter how many bags you bring in. You do not have to be here for the sale unless you want to shop. Remember you want to get rid of this stuff, so price accordingly. Items not sold can be returned to you or donated to one of the groups we donate to. 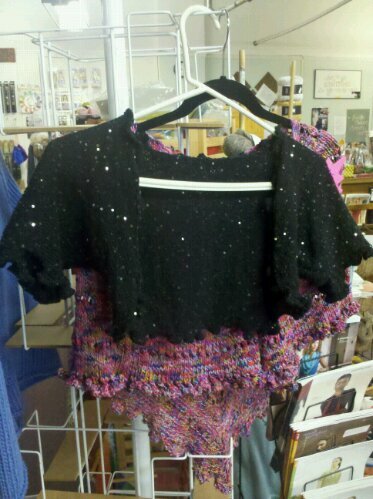 Don’t forget that the “Black Sweater ” class starts tomorrow from 6-8pm. Pics are of Kate’s 8th grade graduation shrug. It looks adorable on her! 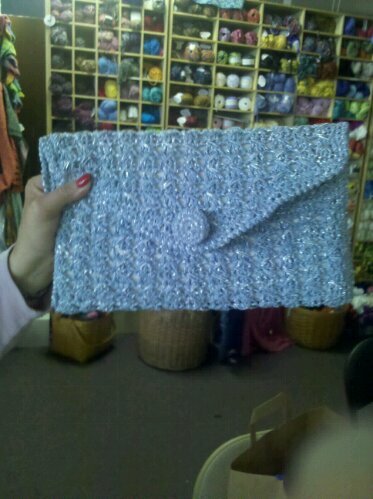 The blue clutch is Susannie’s next Crochet class. The pattern is from the 40’s. Dates will be available Fri. The Classic Elite Knit A Long is in full swing. We will meet Tue nights from 5-7pm starting next tues (may 24). It is not too late to join us. Remember that if you finish your Classic Elite Project by July 31,your name will go into a drawing for a $100. basket of goodies from Classic Elite Yarns. There will be 1 winner from every shop that parricipates in the knit along. See you tues.
Don’t forget the overnighter is tonight. Also, there are only 15 spots left on the bus to STITCHES. Tell your friends! 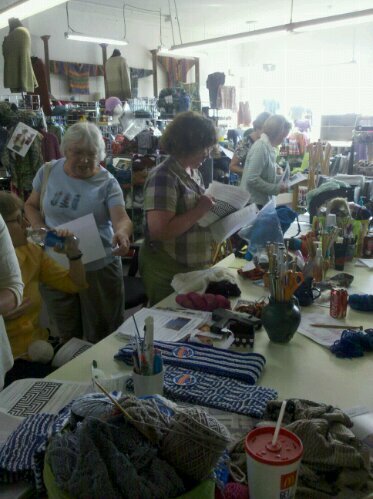 Also a very special thank you to Sarah Burton for coming in Thursday night for Super Bowl Scarf Knit Night. It was very kind of her to share her patterns with us!